What is a bangka? It depends on whom you ask. Javier was not thrilled to be out on the water at such a late hour, even if the moon was bright and the rowers competent. Had this been a pleasure tour, the hacendero would have had no complaint, but tonight he wanted to get on with it or go home. 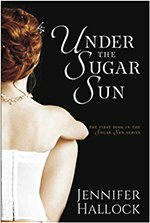 As if they could read Javier’s mind, the rowers abruptly beached the banca, hopped out onto shore, and dragged the vessels away from the water line. 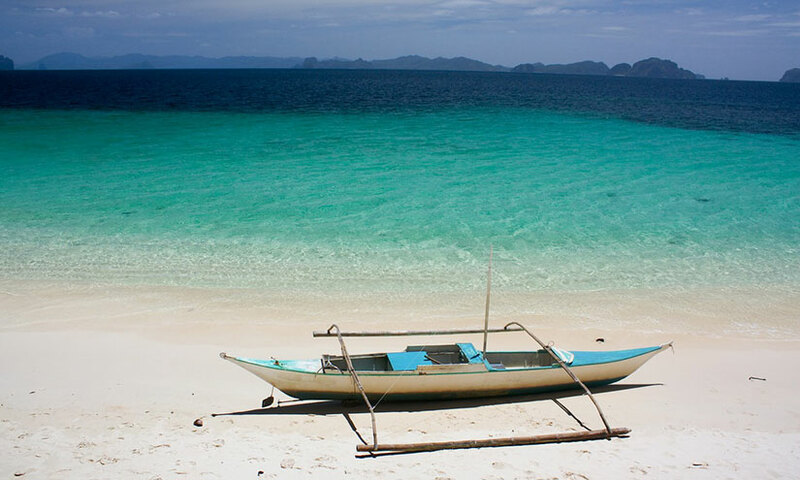 As you can probably guess from the context, banca or bangka means boat—specifically a double-outrigger canoe. If you have visited anywhere outside Manila, you have probably taken a bangka. 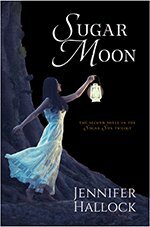 When I first drafted Sugar Moon, Ben and Allie did a fair amount of bangka travel in Samar. 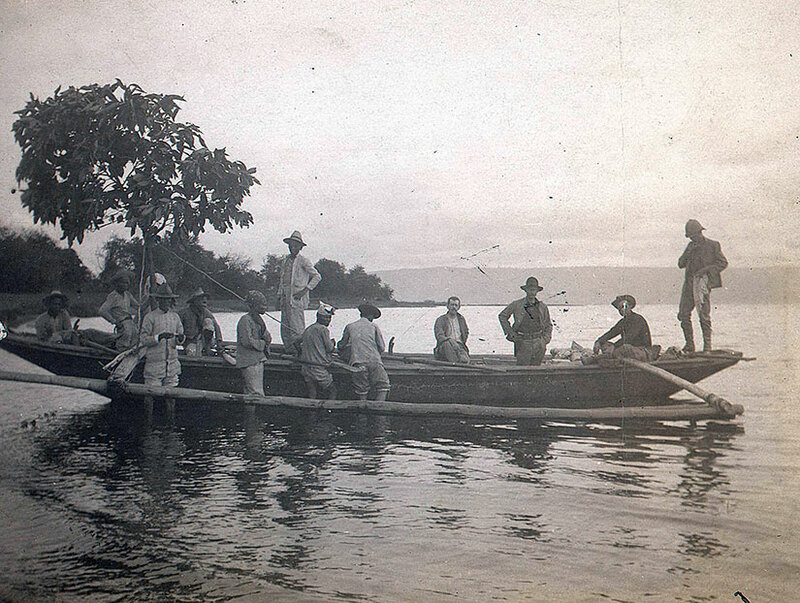 A colonial photograph of a banca in the crater lake of the Taal volcano, accessed at the University of Michigan Philippine Photographs Digital Archive. But here’s the problem: bangka may mean outrigger canoe in Tagalog and Cebuano, but I found out that it means cockroach in the Waray language of Samar, Biliran, and parts of Leyte. While strange stuff happens in Sugar Moon, riding a cockroach through the surf is a whole new level. So I took the word out and used boring old English. This brings up an important point about the Philippines: it the tenth most linguistically diverse country in the world. There are eight language groups, 19 local languages that can be taught in early childhood education (from kindergarten to 3rd grade), and now 200 total languages identified. Such linguistic abundance makes geographic sense. The Philippines is an archipelago nation of 7,641 islands, and it is so spread out that it stretches almost from Seattle to Los Angeles. No wonder one language could not dominate. But this doesn’t make things easy. 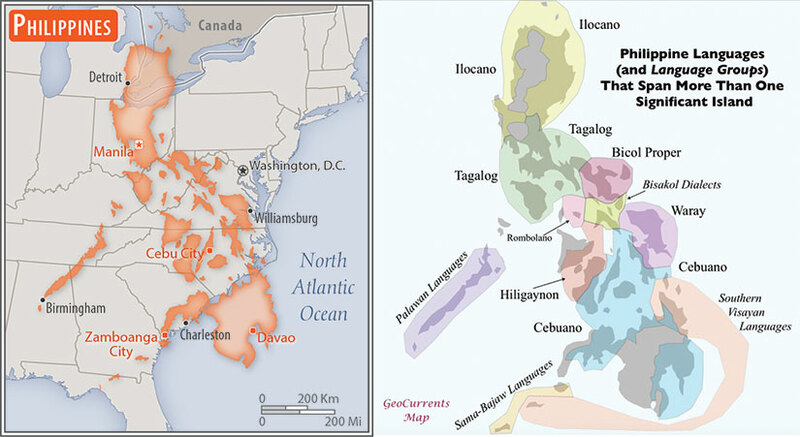 On left, an area comparison map of the Philippines as created by the Central Intelligence Agency; on right, a linguistic map of the Philippines by GeoCurrents. For the purposes of my series, Filipino (or Tagalog) had not yet been designated official (1937), which means that regional languages, such as those in the Visayas (like Cebuano and Waray) would have been even stronger at the beginning of the twentieth century. I have to thank Liana Smith Bautista (and her mom) for being my newest go-to research sources on Cebuano, though all errors in my books are my own. I also am deeply indebted to the creator of the amazing Binisaya online dictionary and reference guide. 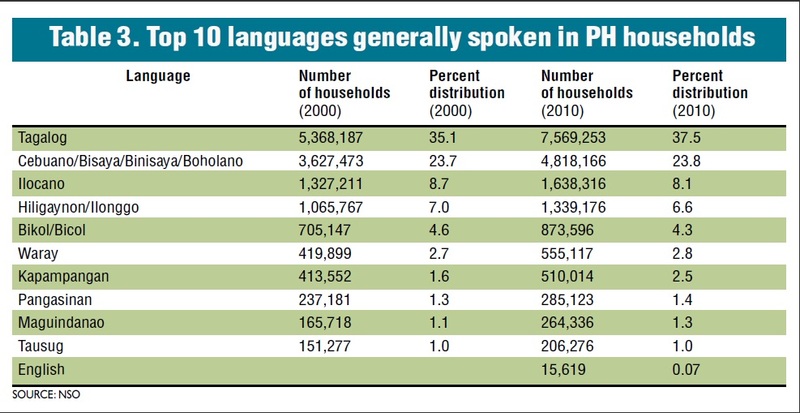 From the article “Debunking PH Language Myths” in the Inquirer newspaper. Ben’s respect for Allegra’s intelligence has been one of the most fun things about writing this couple. 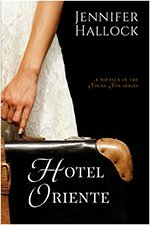 He is not a scholar and doesn’t pretend to be, but he is not intimidated by her skills, either. In fact, as we’ll see, he needs them. So we’ve gotten a little bit away from the bangka in this glossary “definition”—sorry—but you probably just needed a picture for that. (If you want more nautical know-how, read about this group trying to help local fishermen design bangkas out of fiberglass—a light, durable, super-typhoon-proof alternative to wood.) Otherwise, I hope that you, like me, have learned a larger lesson about language through the study of this one little word. Maybe we all need a vacation to ponder these languages a bit more. Photo at Pixabay. Featured photo at top of post also from Pixabay.